Last year, SZU-China submitted part C125-TupA( BBa_K2232003) , which is the coding sequence (CDS) of a cytoplasmic protein TupA (GenBank: BAB07375.1). This protein catalyzes the conversion of glucuronic acid and L-glutamic acid to polyglucuronic acid and poly-γ-L-glutamic acid.Besides this gene plays a key role in pH homeostasis and increases the alkali resistance of Bacteria. But it’s a pity that there was no data at the protein level in 2017 SZU-China iGEM’s project. This year we decided to make an improvement about that.We submit part C125-TupA-6His( BBa_K2788020) which add a His-tag at the C-terminus of the protein so that we can gain this cytoplasmic protein by histidine-labeled affinity column chromatography, and analysis at the protein level is easier. Fig.1. 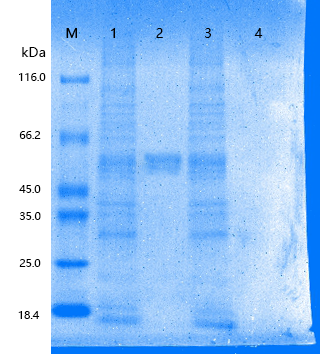 SDS-PAGE analysis of total protein and the product of protein purification.M: marker ladder; Lane 1: total protein of C125-TupA-6His transformant; Lane2: the product of protein purification of C125-TupA-6His transformant; Lane3: total protein of C125-TupA transformant; Lane4: the product of protein purification of C125-TupA transformant. It can be seen that the histidine-tagged fusion protein was successfully expressed. Lane 2 showed the band corresponded with the molecular weight of TupA(57.3kDa), while lane 4 had no band. We added a histine-tag at the C terminal of the TupA protein so that histidine-tagged affinity column chromatography can be performed. Besides the histine-tag could be an antibody recognition site, and there are many prepared antibody on sale. Some protein like TupA has slim studies on it. and there is no prepared antibody on sale. Once with his-tag, we can do Western Blot and other technique based on antigen-antibody reaction. The research on TupA’s expression is more smooth.